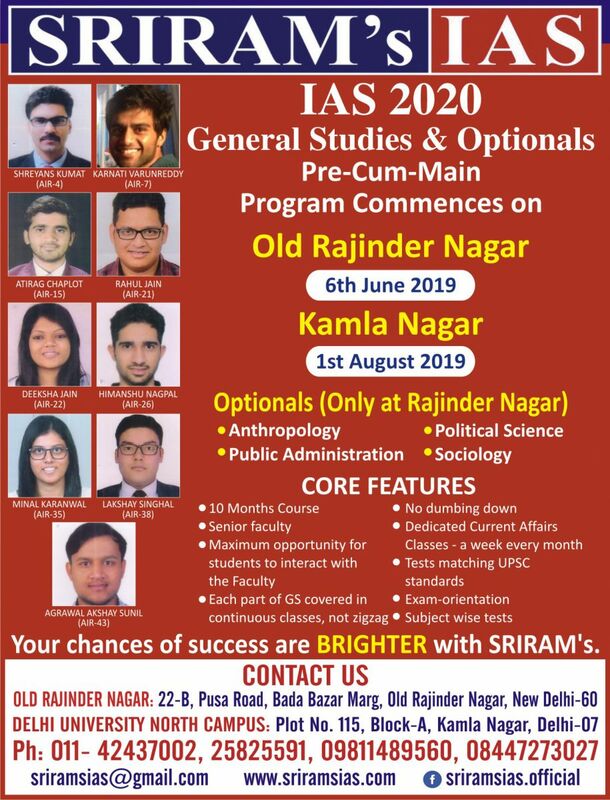 Continuing with our phenomenal success over the last more than two decades with thousands of successes and toppers into the coveted Civil Services, SRIRAM's IAS announces the 10-months Program for General Studies (Prelim and the Mains), Essay, CSAT and Optionals to be conducted by UPSC for 2018 Examination. The Coaching is imparted in English medium only. All the classes are held for two hours daily. Classes are held with a clear and pre - announced schedule. Faculty is experienced. Our focus is on the New System that is in vogue since 2013. Students are continuously assessed on the Prelims as well as Main Pattern in the classroom. Personal attention, effective teaching, senior faculty and adaptability to the changing trends stand us out. SRIRAM's UPSC Coaching for General Studies includes Study Material, Test Series (Pre & Main), and classes for Essays without any additional payment. Personality Test: will train all its students for interview test also without taking any extra fee. SRIRAM's IAS offers Test series 2018, which is completely aligned with the UPSC pattern and the questions keep the candidates ahead in the competition. Most of the questions requiring critical answers are discussed in the classroom as a part of the curriculum. Students are adequately equipped to update themselves with our inputs in the form of Q&A (Question and Answer) as well as additional information we provide.